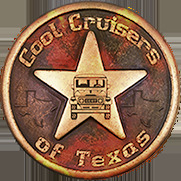 Interior / Exterior Silver / Pewter Trim & Bumper Paint Kit used in all CCOT's FJ40 restorations. CCOT hand mixes Acrylic Enamel paint to match Toyota's Original Silver / Pewter Color. Apply with spray gun for best / original results. This Kit is a must for a quality restoration. Kit Includes: Acrylic Enamel Paint complete with Reducer and Hardener. that you can't get from any spray can. Enough paint to professionally refinish bumpers, mirror arms, glove box door, ash tray door, center console, instrument cluster, filler neck shield, license plate light covers, rear heater, inside door plates, spare tire mounting bracket, and hood hooks. Prepare Surface and Prime with Acrylic Primer. 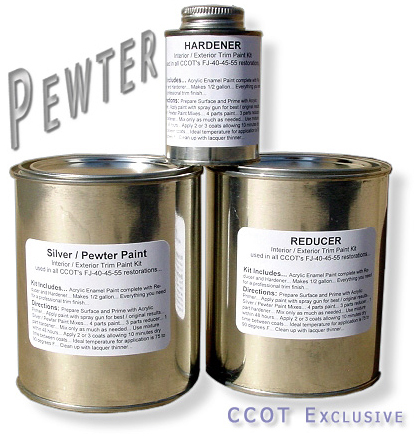 Silver / Pewter Paint Mixes. 4 parts paint. 3 parts reducer. 1 part hardener. Mix only as much as needed. Use mixture within 12 hours. If refrigerated should last up to 48 hours. Apply paint with spray gun for best / original results. Apply 2 or 3 coats allowing 10 minutes dry time between coats. Ideal temperature for application is 75 to 90 degrees F.
Clean up with lacquer thinner. ORM-D (Hazardous Material) Laws allow only ground shipment of Trim Paint to lower 48 States.